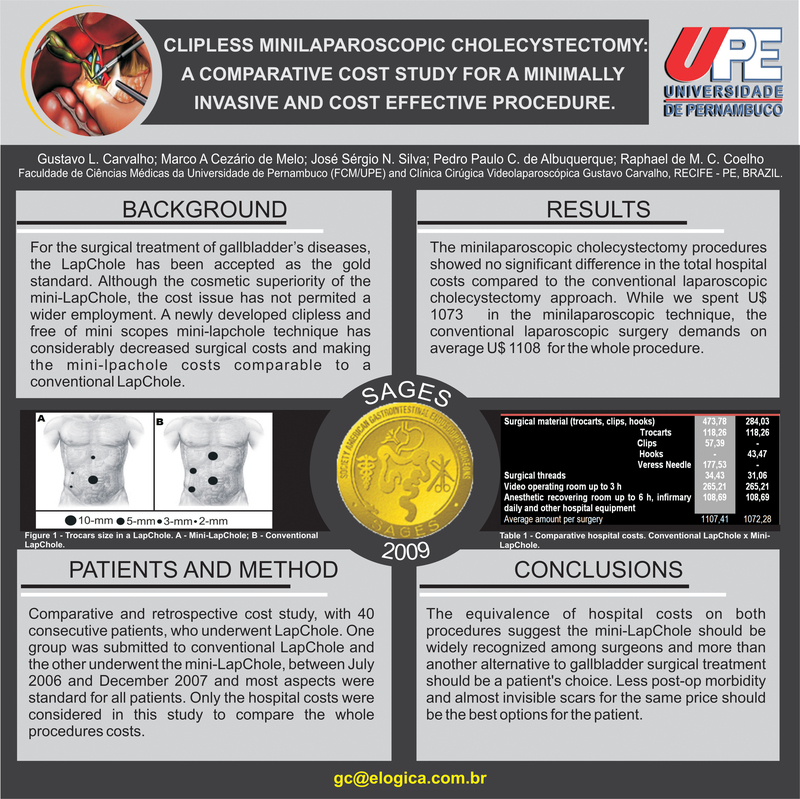 Clipless Minilaparoscopic Cholecystectomy: A Comparative Cost Study for a Minimally Invasive and Cost Effective Procedure. INTRODUCTION: For the surgical treatment of gallbladders diseases, the laparoscopic cholecystectomy has been accepted as the gold standard all over the world. Although, it seems to be clear that the needlescopic procedure, called minilaparoscopic cholecystectomy (MLC) is superior in many aspects when it is compared not only to open surgery, but also compared to the conventional laparoscopic cholecystectomy (CLC). OBJECTIVE: Evaluate the hospital costs of these procedures and specify the differences concerning the two surgical techniques and it is implication in the whole cost of the procedure. METHOD: Comparative and retrospective cost study, with 40 consecutive patients, who underwent laparoscopic cholecystectomy in a private hospital in Recife, Brazil. There were two groups with 20 patients each. One group was submitted to conventional laparoscopic cholecystectomy (10-10-5-5mm with clips) and in the other the needlescopic approach was performed (10-3-2-2mm clipless). MLC Technique: Two trocars of 2-mm, one of 3-mm and one of 10-mm at the umbilical site for the laparoscope are inserted. 3-mm laparoscope, clips, or endobags were not used. The cystic artery was sealed by electrocautery near the neck of the gallbladder and the cystic duct was sealed using surgical knots. Gallbladder removal was carried out through the umbilical site with a glove wrist. All surgeries were performed between July 2006 and December 2007 and some aspects concerning individual differences were standard for all patients. Only the hospital costs were considered in this study and arithmetical medium was reached in the two groups to compare the whole procedures costs. RESULTS: The MLC procedures showed no significant difference in the total hospital costs compared to the CLC approach. While US$ 1.440 were spent in the minilaparoscopic technique, the conventional laparoscopic surgery demands US$ 1.500 for the whole procedure. CONCLUSION: The equivalence of hospital costs on both procedures suggests the MLC should be more used by surgeons. When available, MLC, a procedure with almost invisible scars for the same cost of a CLC, should be offered as an option for the patient.